Sorry this is last minute. I just wanted to remind everyone the Sewing Machine Doctor will be at the Shop tomorrow from 10am-1pm. It's been a busy week, Mom now has what I had last week. So,she's out this week. I will be closing the Shop from 3:00p-3:45p to pick the nieces up from school on Friday. Congratulations to Deb Cole! She is our 1st Place Winner in this month's Fabric Challenge. She made us believe that Spring is really on it's way with her lovely tulip wallhanging. A.J. Hudock came in close 2nd with her beautiful Dresden Plates. Congratulations to both our Winners! Their wall hangings are beautiful! Andover's Downton Abbey has finally arrived! Many of our suppliers have been slow on deliveries due to the winter weather. The Polar Vortex has effected many of the countries who produce our fabrics. 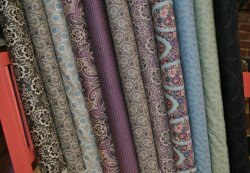 We have one more Downton Abbey fabric we're waiting for. The castle is still on backorder. We will let you know when it comes in. Stay Warm, quilters! Spring is on it's way!